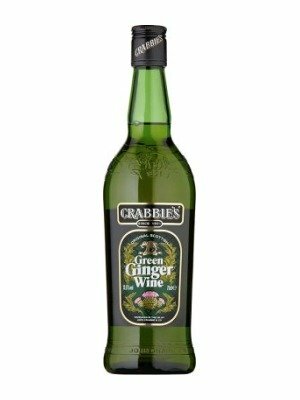 Crabbies Green Ginger Wine is a popular Flavoured Wine available from DrinkSupermarket.com in 70cl to buy online. Visit DrinkSupermarket.com for the best price for 70cl of Crabbies Green Ginger Wine or compare prices on our other Flavoured Wine products. Original Scottish Green Ginger Wine John Crabbie's distinctive elephant trademarks stems from the Scots merchant adventures who pioneered trade with countries from the orient, from which we still buy the herbs, spices, fruit and ginger (a reputed aphrodisiac and cure for 'mal de mer') for Crabbie's Original Scottish Green Ginger Wine. It was during the time of the raj that another Scot, a Colonel Macdonald, first created the famous 'Whisky Macdonald' or 'Whisky Mac' (equal measures of Crabbie's and Scotch whisky), a truly warming experience. Where to buy Crabbies Green Ginger Wine ? Crabbies Green Ginger Wine Supermarkets & Stockists. You can buy Crabbies Green Ginger Wine online in most retailers and find it in the Flavoured Wine aisle in supermarkets but we found the best deals online for Crabbies Green Ginger Wine in DrinkSupermarket.com, TheDrinkShop, Amazon.co.uk, and others. Compare the current price of Crabbies Green Ginger Wine in 70cl size in the table of offers below. Simply click on the button to order Crabbies Green Ginger Wine online now.